Rarely available - MAINTENANCE FREE - villa located in Lakeside Plantation! This gorgeous LAKE VIEW villa has been completely upgraded and is ready for new owners! Open and spacious floor plan with 2 bedrooms plus an OFFICE/DEN, 2 full baths, 2 car attached garage and peaceful views of the lake! Large kitchen with BRAND NEW STAINLESS STEEL APPLIANCES, GAS STOVE, GRANITE COUNTERTOPS, GRANITE COMPOSITE SINK plus a BREAKFAST BAR! The master suite boasts a huge walk-in closet, dual sinks plus a large walk-in shower! 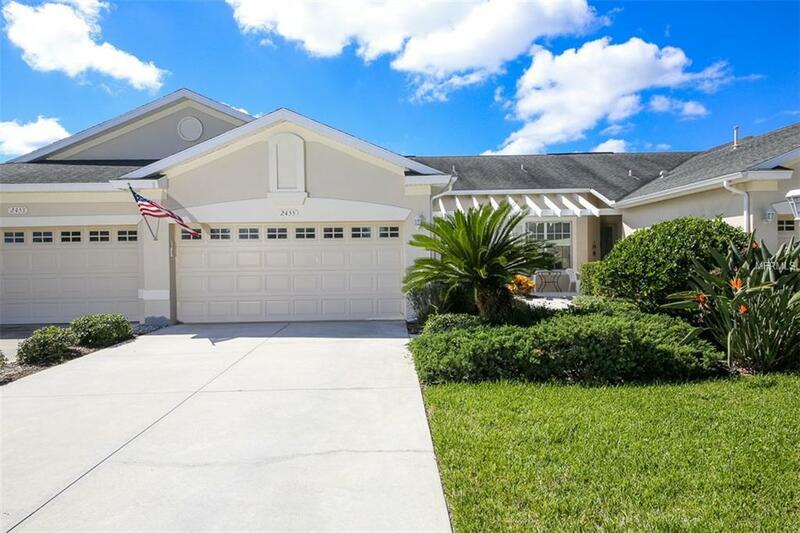 Beautiful ceramic tile throughout the main living areas, new WOOD LAMINATE flooring in the bedrooms, freshly painted in soft coastal colors, large lanai with TILE FLOOR, garage has epoxy finished floor with built-in work areas and shelves, built in desk and cabinets in the office/den. AC replaced in 2012, Gas hot water heater and stackable washer and gas dryer replaced in 2014. All maintenance on the exterior is covered by the HOA including roof and exterior insurance! Best of all, this home is not located in a flood zone! Lakeside Plantation is an established community with full amenities including 2 community pools, tennis courts, fitness center, billiard room, pickleball court, basketball court, playground, picnic area, monthly planned social activities and so much more! This one is a must see! CDD fee is included in the property tax bill.